Helping Families Handle Cancer was founded in 2008. We are a Not-For-Profit Organization specifically designed to aid families financially while they are dealing with cancer. Cancer creates an enormous strain on a family, both emotionally and financially. We aim to alleviate some of this stress by providing monetary support to those in need. Having a child with a life threatening illness such as cancer puts much additional stress on a marriage, and often contributes to divorce or separation. This stress can also cause temporary or long term health issues for the parent(s). Helping Families Handle Cancer dedicates our time to single parents or families living on one income. We are excited about this foundation, as no other organization exists to help families with these specific needs. 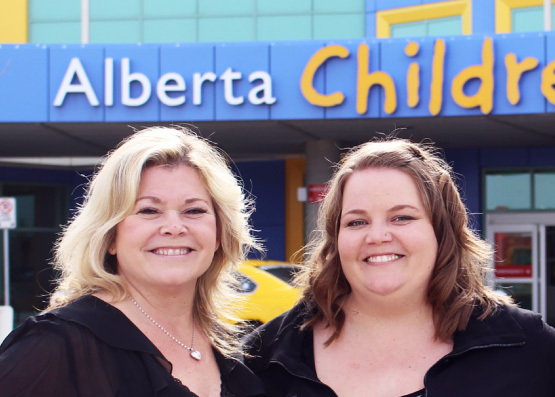 Helping Families Handle Cancer assists families who have been referred by social workers from Alberta Children’s Hospital. The success of our foundation rests on the enthusiasm, dedication, and compassion of our volunteers, and on people like you. Read more about how to get involved. Helping Families Handle Cancer was founded by Carie Stock, a childhood cancer survivor who wanted to use her childhood experience to impact others. At a young age, Carie was given only a 10% chance of survival. Her mother was a single mom at the time, and because Carie was so sick, she spent long days at the hospital. Carie’s mother was forced to put her life on hold during Carie’s illness. Although this forged an incredible bond between them it took a large toll. The stress of bills, caring for a very ill child, raising another healthy child, all while being a single mother, was very difficult. As Carie reflected on the many hardships her mother endured, she was deeply moved and the inspiration led her to the idea of starting a foundation that could make a difference: Helping Families Handle Cancer was born. Carie turned a life experience that most people would want to forget into her life’s work. She grew up knowing that she had a purpose in life helping others. No family should have to experience unmanageable financial burdens in the midst of a health crisis. Carie has been involved in a number of cancer related activities, such as fundraising for research, which included shaving her head at the age of 18. She was on the board of directors for a cancer charity for 3 years, has attended world wide conferences involving support groups, and has been a camp counselor and mentor at children’s camps for cancer survivors and their siblings. Carie’s “story” and life experiences have been covered by the media since she was 2 years old. In 2007, Carie was the recipient of the Terry Fox Humanitarian Award. In February 2012 Carie received the Woman of Vision Award through Global Television. Her passion to help others is the fuel behind Helping Families Handle Cancer and a guide to those involved in it.